Hours: Monday - Friday 10 a.m. to 6 p.m.; Saturday 11 a.m. to 5 p.m. I am a button fanatic. I frequently replace the buttons on the clothes I buy because I feel that buttons are a detail many RTW manufacturers think they can skimp on. I cringe when I see fellow sewists create a stunning jacket and then ruin it with cheap-looking buttons. There's no need to limit ourselves to the meager selection at Jo-Ann's when places like M&J Trimming sell beautiful buttons online. And if you're visiting NYC's garment center there are several excellent button stores, including LouLou Buttons on W. 38th Street. LouLou Buttons is small and more manageable. When costumers for stage and screen need buttons they turn to LouLou Buttons. I've chosen LouLou Buttons for several jackets and tops I've sewn and will continue to shop there. LouLou Buttons is just one long room of buttons. But what buttons they are. 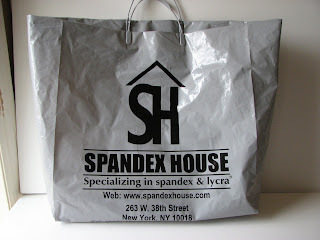 Best for: Hard-to-find hardware, like jumbo covered snaps, Riri zippers, covered hooks-and-eyes, etc. Pacific Trimming, with its crowded aisles of bric-a-brac, reminds me of the five-and-dime stores of my childhood, where you could always find something to make you happy. I dare you to walk out of this store without buying anything. Pacific Trimming is on my list of Garment District trim stores I regularly go to. Need hardware for that handbag you're making? Belt buckles for your safari jacket? Rings for your bikini? This is the place. It's cramped, though recent changes in store layout helped, and it's often crowded with designers' assistants and FIT and Parsons students, but there is usually enough sales staff around to answer questions and help you find things. This post would go on and on if I included all the photos I took at Pacific Trimming. There's such a variety of stuff. Even if you don't have any trim or hardware on your shopping list, do yourself a favor and stop in here anyway just to experience that kid-in-a-candy-store feeling that you never get at Jo-Ann's or Hancock's. Or, just come along on a Speakeasy tour! Pacific Trimming has loads of buttons. Visit Pacific Trimming for sportswear zippers of all colors and sizes. They'll also cut zippers to your exact measurement. Need a chain for your Chanel jacket? 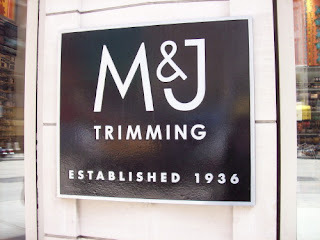 No visit to the Garment District would be complete without a trip to M&J Trimming. I wish my photos did better justice to this emporium of all things embellishment. You'll just have to take my word that M&J Trimming is retail nirvana for trims, beads, appliqués, buttons, cords, ribbons, sequins, sew-on jewels, nailheads, rhinestones and much, much more. 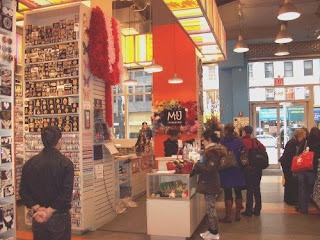 M&J Trimming has an excellent online store but it only represents about a fraction of what you'll find at the real thing on Sixth Avenue. If you're looking for trim by color, you won't just have a handful of choices in that color--you could have fifty to a hundred different options. It's almost mind-boggling. The store has these nice big counters where you can spread out your garment and try out all the various things you've grabbed. No one bothers you while you agonize over which embellishment works best. 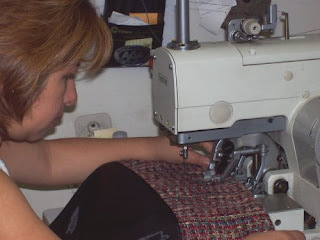 The staff is mostly young and look like they've never sewn a seam in their life, but they are very knowledgeable about the store's inventory and friendly to boot. The store is actually open on Saturdays and Sundays! And hidden in the rear of the store, next to the restroom (extra points for having a restroom! ), there are shelves with all the sale items. You can always find some interesting stuff back here on sale. Now some people say M&J is pricey but I think their prices are fairly reasonable for the quality of the merchandise. They carry some of the basics you'll find in your local Joann's or Hancock's but M&J's prices are generally the same on these goods, not higher. 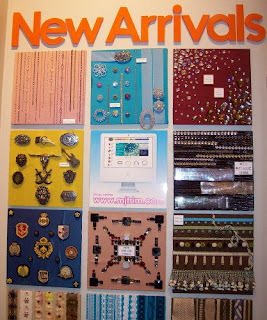 You may be floored to pay $35 a yard for beaded trim but you can be guaranteed the trim will make your outfit. M&J's is one of the best places to shop for braids to adorn that Chanel jacket you've always wanted to make; I purchased some beautiful chocolate-brown velvet braid here for my Chanel-style jacket. A view of M&J looking out toward Sixth Avenue. Love the high ceilings. Here are those big counters that are perfect for spreading out your garment as you experiment with different embellishments. A bulletin board calls your attention to the newest additions. The selection at M&J's is what keeps me coming back again and again. 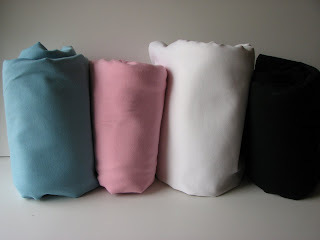 Just look at all these suede tassels in different sizes and colors. If you have a very specific fabric or look in mind, Mood will have it. With three floors of fabric, Mood has just about everything. The main reason to come here. 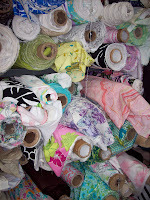 It's fun to eavesdrop on FIT and Parsons students and young designers-in-training as they ponder their fabric choices. And this is the store Project Runway sends its designer contestants to: You could be fondling the same silk that Christian Siriano touched! I love everything I buy at Mood because it is usually exactly what I wanted: the right color, the right texture, the right fabric content. Normally when I shop for fabric with a pattern in mind, I am always compromising because I can't find specifically what I envisioned. At Mood you can actually create the garment that's in your head because they have such a wide selection of quality fabrics. Italian sweater knits at Mood. This is just a small portion of the many bolts of bouclés and tweeds you'll find. Yummy! Service at Mood can range from cheerful and helpful to "I'm too cool to make eye contact with you." Fortunately my experience has largely been the former. My daughter needed some fabric swatches for her FIT class, so I told a Mood employee what the specific assignment was and asked for help. She grabbed her scissors and swatched her way through the store for me. Another time I visited the store wearing the bouclé jacket I made and the man who cut the fabric for me recognized me and made a big fuss over my jacket. The last time I was there the woman who was cutting some white piqué for me and she noticed a smudge on it—which I could tell would wash right out—but insisted on giving me 10 percent off. But it goes without saying though that the less crowded the store is, the better customer service you'll receive. Mood's signage makes finding the type of fabric you're looking for much easier—important because there is so much to see here. The hub on the main floor. 5/26/10: Mood is now selling Vogue Patterns! 15% off the retail price. 6/20/09: Mood has expanded its trim department. An employee told me trims were selling well at the store so they moved them into the nook where leather used to be and relocated leather downstairs to the home dec department. I think their button and trim prices are good, often better than Pacific. Hours: Monday-Friday 9:00 a.m. - 6:30 p.m.; Saturday 9:30 a.m. - 5:30 p.m. If you're shopping at Daytona Braids & Trimmings and happen to notice some movement in the air conditioning pipes overhead, do not panic and immediately recall the news footage you saw of rats overtaking a Manhattan fast food joint. It's only Ric, the friendly orange tabby cat who lives there and keeps watch over the store. Or it could be his brother Rac, who's equally affectionate. 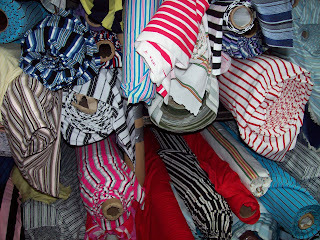 Ric and Rac are two good reasons to shop at this trimming mainstay in the garment district, but the hundreds of yards of braid and trim at reasonable prices are why you'll want to come back to Daytona again and again. Ric the cat (above) patrols Daytona, stopping to allow customers to pet and ooh and ah over him. Gotta love a store with not one but two cats. 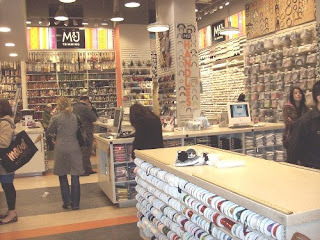 I first came here looking for a suitable drawstring for my anorak and found an entire wall of cords in all widths, colors and textures. Looking for ric-rac or braids? There's an unbelievable selection, again in every size and color. 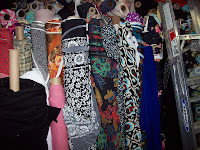 I was wowed by all the different kinds of elastic trims they have; this is the definitely the place to go to buy finishing touches for your knits and lingerie. And Daytona also has a worthy array of fancy trims, laces and ribbons—I picked up some Anthropologie/Free People-style trims for my daughter to decorate her Gap tank tops, plus some gold trim for a navy-and-white dress I plan on making. You'll find a decent selection of out-of-print McCall's patterns, buttons, zippers and other fasteners at Daytona; plus notions, including hard-to-find Klassé sewing machine needles. Upstairs there's 15 to 20 different brands of yarn along with embroidery and needlework thread (and accompanying notions, like knitting needles). The service at Daytona is pleasant and eager to serve. A young staffer followed me around with a basket and a pair of scissors as I pointed out trims and cords for her to cut. The store is small but well-stocked. I could have easily spent an hour here just taking it all in and cataloging it in my head for future reference. For price and selection, I consider Daytona Braids & Trimmings a must-visit store in the garment district. Out-of-print McCall's patterns (a quick look led me to believe it was mostly early 90s patterns) in a bin in front of spools of ric-rac. A wall of ribbons and trims at Daytona. I couldn't get over how many varieties of elastic Daytona stocks. I think I spent 20 minutes alone just considering the different types of foldover elastic. In case you're interested, there's plenty of yarn and needlework supplies upstairs at Daytona.